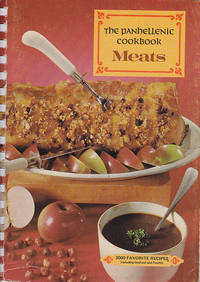 Montgomery, Alabama, USA: The Panhellenic Cookbook, 1968. First Edition . Spiral-bound. Very Good/No Jacket. 8vo - over 7¾ - 9¾" tall. Very good white spiral bound color pictorial card covers. Some wear, creasing. 1968, 8vo, , 2-382pp. , 2,000 favorite recipes including Seafood and Poultry. Recipes include: Cabes' Chuck Roast, Chuck Wagon Pepper Steak, California Barbecued Beef, El Poche Marinated Spencer Steaks, Omaha Broil, San Francisco Steak, Scotch Shish Kabobs, Kau Kau Beef en Brochette, Crab Stuffed Bantams, Congressman's Bean Soup, Maine Fish Chowder, Grossmama's Lamb Soup, Kentucky Style Bakes Steak, Barna's Steak Parmesan, Texas Chili, John Marzetti, Mostaccioli, Milamo, Tagliarini, Goup, Loblolly, Boone County Ham, etc.